East Lothian is one of the most picturesque areas of Scotland. Starting at the eastern fringe of Edinburgh, it is bordered on the south by the Lammermuir Hills and stretches in an easterly direction to the Scottish Borders at Cockburnspath. As well as offering a magnificent coastline, it boasts beaches, golf courses, charming villages, museums, galleries and historic attractions as well as more hours of sunshine than anywhere else in Scotland. Described as a golfer's dream, East Lothian includes Musselburgh Links, noted as being the oldest surviving golf course in the world. Most famously, East Lothian is home to Muirfield, host to the Open Championship 14 times. During the summer East Lothian hosts numerous festivals including Fringe by the Sea at North Berwick, North Berwick and Haddington Highland Shows, Air Show at the Museum of Flight and 3 Harbours Arts Festival in Prestonpans. The area has a great many places of interest to visit all year round. These include The Museum of Flight at East Fortune, Glenkinchie which is Scotland's most southerly distillery and The Bass Rock, a sanctuary for birds and the third largest gannet habitation in the world. There are historic castles to explore and enjoy; Hailes, Dirleton and Tantallon - to name but a few. John Muir Birthplace in Dunbar is also worth a visit where the life and works of the conservationist and founder of America's National Parks are revealed. East Lothian is also home to a number of exceptional beach areas where you can choose to relax, dream and just enjoy the views or for the more energetic, surf at Dunbar or sail in North Berwick. Longniddry is particularly good for bird watching with excellent views to Edinburgh and the Forth Road and Rail bridges. Gullane is a great setting for a peaceful stroll, dip or swim. Yellowcraigs has splendid views over the Firth of Forth to the Island of Fidra, where Robert Louis Stevenson often visited the beaches (it has been suggested that he based his map of Treasure Island on its shape), it is also home to a substantial seabird population. The seaside town of North Berwick possesses a string of lovely beaches that offer stunning views and trips around the impressive Bass Rock. This gorgeous cottage is within easy reach of Edinburgh via rail, which takes the visitor straight to the heart of the city, or by road - so you can have the best of the stunning countryside and explore the capital city too! Bramble Cottage is a romantic, intimate and secluded luxury detached cottage for couples looking for privacy in a beautiful five star Visit Scotland graded property which is located on a private farming estate. 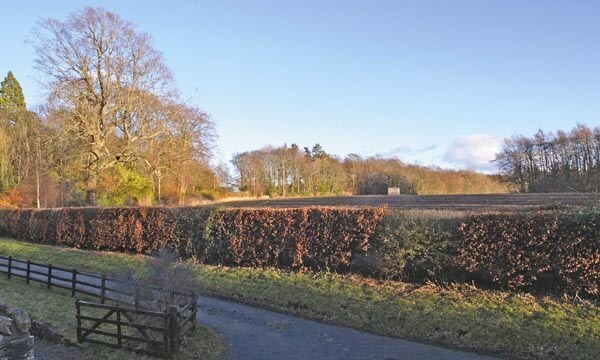 It is situated adjacent to the owner's house at the end of a long private single-track road, surrounded by farm and mature woodland. It is the very essence of beautiful East Lothian countryside. The only sounds are birdsong, clip-clopping of horses' hooves and pheasants calling out to friends! 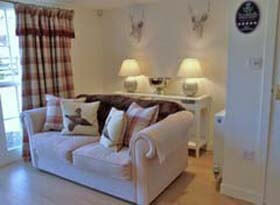 The accommodation comprises of: Ground floor: Entrance hall. Living-room with dining area. The living room has a flat-screen TV with integrated Freeview and a separate DVD player along with a BOSE Wave music system with integrated CD player. The fully equipped kitchen is fitted to an extremely high standard with all necessary appliances and includes integrated fridge, freezer, and dishwasher, along with washing machine, combined microwave/oven, ceramic hob, grill and oven. Shower-room with WC, wash-hand basin and heated towel rail. 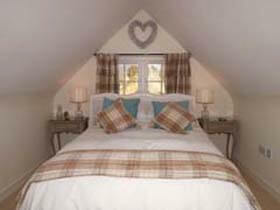 Upper floor: Double bedroom, separate bathroom with heated towel rail and generous storage for clothes/sundries. There are low coombed ceilings upstairs so care needs to be taken. Originally built in the early 1800s as farm-worker accommodation, Bramble Cottage has recently been extensively upgraded to cater for every modern-day need, whilst still retaining its full character on the outside with random-rubble stonework construction and a traditional pantile roof. A note for Sat-Nav users: Tom Tom's etc. will send you via the road to Humbie and on to 'House of Muir'. This leads to a dirt track. Please ensure you follow directions below via Pencaitland village only - thank you. 1. From A1 (both directions), take the slip road sign-posted Macmerry, Pencaitland and Glenkinchie Distillery. Following directions to Pencaitland, pass through Boggs Holdings and at the "T" Junction, turn left, then right at the staggered cross-roads. Pass through traffic lights and follow from STEP 3 below. 2. From A68, follow sign-post to Haddington (A6093). 3. Upon arrival in Pencaitland, turn into the road signposted for Glenkinchie & Lempockwells, which is directly opposite the SPAR shop (doubles up as a garage [Gulf] for petrol). 4. Take the THIRD ON THE RIGHT (Huntlaw Road). You will know it is the correct road, as you will see an old railway bridge about 400 metres above in front of you. 5. Carry on up this road, which now becomes single track immediately after the bridge (you will see Glenkinchie malting towers on your right hand side). 6. At the top of the rise, where the "main" road turns 90 degrees left, there is a Private Road straight in front with signs noting "No Public Road for Vehicles" and "Fountainhall Only". Continue up this single track road. 7. There are FOUR UNMARKED SPEED BUMPS on this road. Continue over them all, with care - maximum speed 20 mph, as it is often used by horse riders. 8. The road will eventually split in to 3 - take middle road which will take you down a small sloping road. 9. At the bottom, bear left. Bramble Cottage is at the end of this road (50m) on your right-hand side - just beyond the main house. All central heating, electricity and hot water is included in the rental price. 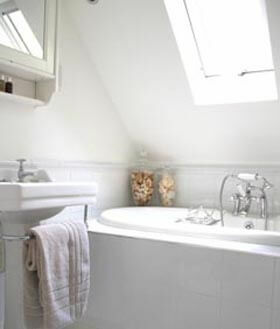 There are radiators throughout and heated towel rails in the upstairs bathroom and downstairs shower-room/WC. All bed linen is provided along with two full sets of towels (bath sheets, bath towels and hand towels) and complimentary use of two fluffy white towel robes. Also provided are Molton Brown toiletries, two pairs of slippers and a gorgeous Guest Welcome Pack which includes essentials. 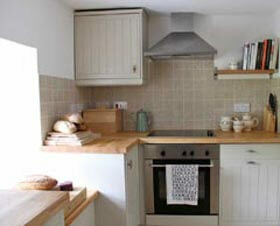 Bramble Cottage is rented out throughout the year. Change over day is Friday arrive after 4pm - or by arrangement, depart by 10am. 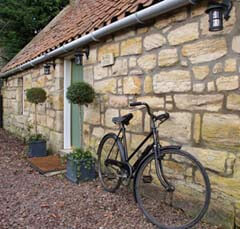 Short Breaks also available in low season: Friday to Monday - weekend breaks. Monday to Friday - midweek breaks. To book this 5 star luxury country cottage near Haddington, click the enquiry button below and view availability and rental prices. 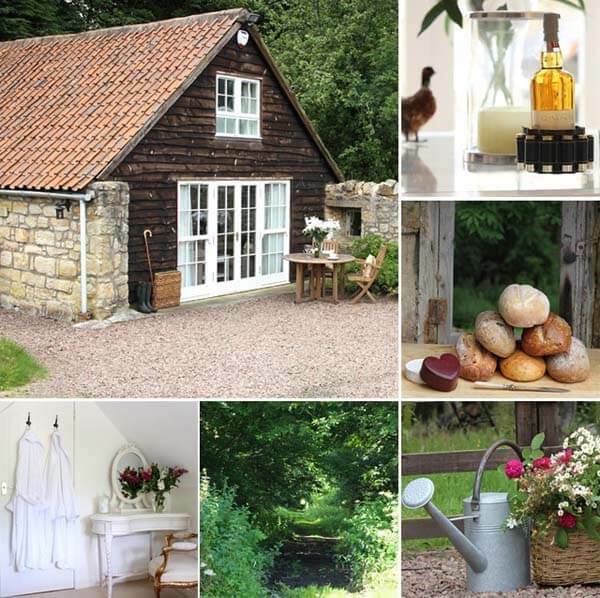 This is a stunning 5 star cottage in beautiful East Lothian countryside - ideal for a break for a couple or for a Scottish honeymoon. 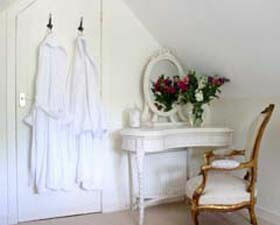 There are many special touches which make this a very romantic cottage - fluffy white bathrobes are provided along with slippers and Molton Brown toiletries - all very luxurious!